Rates are subjected to 10% service charge and prevailing government taxes. - Reservations must be cancelled or modified 3 days prior to guest arrival day to avoid full cancellation fee for non promotional rates. - For booking of non-refundable promotional rate plans, you will be charged in full for the booking. Please be aware that there will be no refunds on cancellations. Cancellation will result in forfeiture of 100% of the booking. - Full reservation charge for any No Show booking. Management reserve the right to amend the Terms and Conditions prior notice. A refundable security deposit of SGD100 per room is required upon check in. Child below 10 year old stays for free using existing bed. Additional occupant of 10 year old and above is chargeable at SGD20 nett per night using existing bedding. Only registered guests are allowed in hotel rooms. All visitors must leave the premise by 11pm. Minimum age requirement for check in is 17 years old. No pets are allowed at the hotel. Cleaning Fees of SGD200 will be imposed if guest is caught smoking in the room. No Durian is allowed in the hotel premises. Cleaning fees of SGD200 will be imposed. Credit card used as mode of guarantee has to be produced during check in for verification purposes. Excellent service at competitive rates. Harbour Ville Hotel Singapore, is a boutique hotel ideal for travellers seeking budget-friendly accommodation. Within close proximity are various attractions, such as the Universal Studios Singapore (USS), Sentosa, Chinatown, Southern Ridges, Mount Faber and the lively Raffles City. 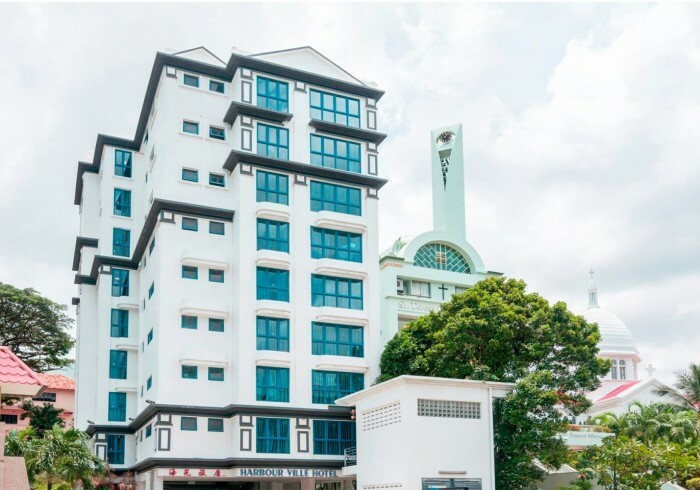 The hotel is a mere 3-minute drive away from the cruise centre and 5-minute drive from Chinatown and the Central Business District. More importantly, Changi International Airport is just 20 minutes away. Harbour Ville Hotel offers 100 tastefully designed rooms with competitive rates, thus making your stay comfortable and delightful. Our air-conditioned rooms come with large windows that allow plenty of light in. With our friendly and personalised service, we make sure that your stay is worth your every cent.